It’s that time of the year again - the time we look back on all of the success that our clients have had with our tools. So I scoured through the top landing pages of the year with the highest number of conversions and selected the most noteworthy. I definitely learned a thing or two looking back on these campaigns and I think you will as well. In this article, I’ve detailed seven of the most successful landing pages of the year, the results they got and why they have such high conversions. HypeForType is an online font store that features 25,000+ fonts from various designers. This is their most successful landing page with us to date - and it’s still active. So far, this landing page has generated over 40,000 emails at a conversion rate of over 45%. And it’s only been live for a couple months! Let’s get into the reason as to why it may be doing so well. It’s a simplistic squeeze page. A squeeze page is a landing page with a hyper-specific purpose, to collect a user email address - and that’s it. They’re not trying to sell anything. They’re usually equipped with some sort of free download (ie. ebook, song, sample, etc.). They are usually very simplistic, like HypeForType’s above. They promoted it. HypeforType has over 125k fans on Facebook. They used the platform to promote their offer, as well as Twitter where they have 29k followers. They also pinned their tweet to their profile so that every time someone visited their Twitter the promotion would be the first tweet they see. I would guess that they set up ads for this landing page as well. The conversion ask. Both the email form field and the CTA button contrast well against the black background of the form. Auto-focus form field. At Wishpond we used auto-focused form fields to increase our website conversions significantly. This small adjustment increased our conversion rates on our signup page by 45%. I definitely recommend testing it out on your own pages! No navigation bar. Once a visitor has made it to your landing page, your only choices is to convert or to leave the page. And they’re converting almost half of the people that come to this landing page! That’s pretty impressive. Next we have Driscoll’s Reward Club offer. Driscoll’s is an American company that has been selling berries for over 100 years. This landing page is asking visitors to sign up for their rewards club in order to receive their updates and a 50 cent coupon for their berries. Driscoll’s Rewards Club landing page has generated almost 8,000 emails at a conversion rate of approximately 40%. The landing page is completely focused on conversion. Driscoll’s page is designed similarly to the above squeeze page, but it features more form fields. I’m actually impressed that a form with so many fields for the offer has a conversion rate this high! Always make sure that your offer aligns with what you’re asking from the lead. No navigation bar. Again, this landing page has no navigation bar, which is a common theme among high-converting landing pages. It eliminates the choices the visitor can make - either convert or exit the page. A clear headline. Driscoll’s is very clear about what you’ll get if you convert on their form. You wouldn’t even have to read the subheadline to know what they’re offering. Bishop T.D. Jakes is a successful entrepreneur and best-selling author who works as senior pastor of The Potter’s House, a global humanitarian organization and 30,000-member church located in Dallas. He has over 2 million followers on Twitter and 4+ million on Facebook. Whoever is responsible for his landing page campaigns is doing a bang-on job. T.D. Jakes’ landing page has generated over 12,000 emails at a conversion rate of over 50% so far. It’s still live. The offer. I really like the idea of giving away content that adds to an offer. See how we incorporate a similar tactic (content upgrades) with our blog posts here. “Free” communicates the value. “Free” is the value proposition. 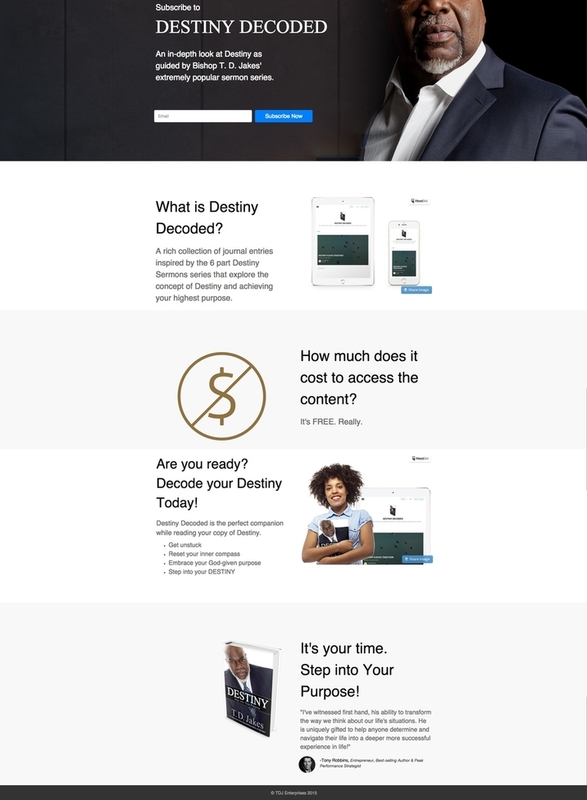 The landing page gives leads instant access to T.D. Jake’s journal entries after they enter their email address. It’s motivational. T.D. Jakes is a motivational speaker as is, and his landing page truly reflects that. Copy like “It’s your time. Step into your purpose!” emulates him and his work. The review enforces trust. Even for celebrities, adding a form of trust is still highly encouraged. People need to know that you and the content you’re creating are legitimate and endorsed by others. SkipTheDishes allows you to get food delivered to you from a range of restaurants that don’t actually deliver - so SkipTheDishes does it for them. You order food through the SkipTheDishes website or app, and the service gets you in touch with a courier that will pick up and deliver your food to your door. 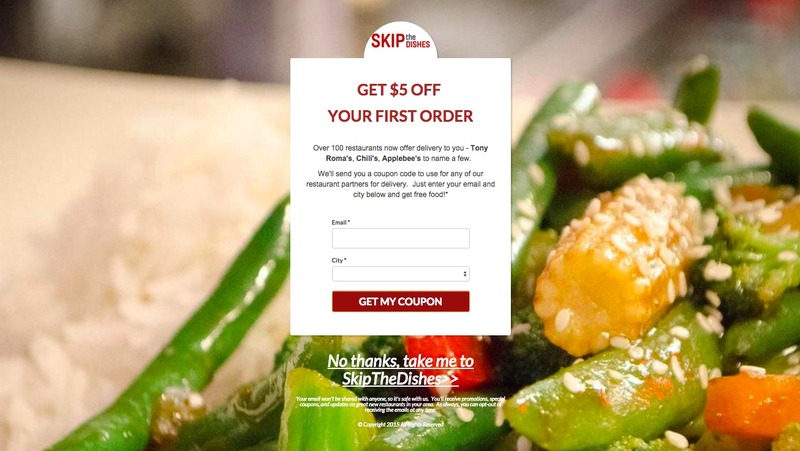 SkipTheDishes’ landing page has generated over 7,000 emails at a conversion rate of almost 7%. Simple ask. This is an offer appealing to anyone who likes to get their food delivered. SkipTheDishes is offering a $5 coupon off one of any of their 100+ restaurant’s delivery service in exchange for just a city and email - which is definitely a fair deal for the lead. I’ve seen $5 coupons ask for a lot more information from leads than that. Strong headline. It’s straightforward and stands out well with the whitespace around it. Okay, so here we have another one of Bishop T.D. Jakes’ landing pages. I wasn’t going to include it but, as it has a completely different layout, I thought I’d point out how you don’t need a specific format to achieve great results. This landing page has generated over 6,000 emails for T.D. Jakes at a conversion rate of almost 50%. Singular form field. A form with a singular field is more likely to convert than a form with more fields, that’s just how it goes. The more fields, the more intimidating it appears to the potential lead. Succinct text There is no text on this page that doesn’t need to be here. The offer isn’t asking much from the lead (only an email address) so the information on the page doesn’t need to be heavy. 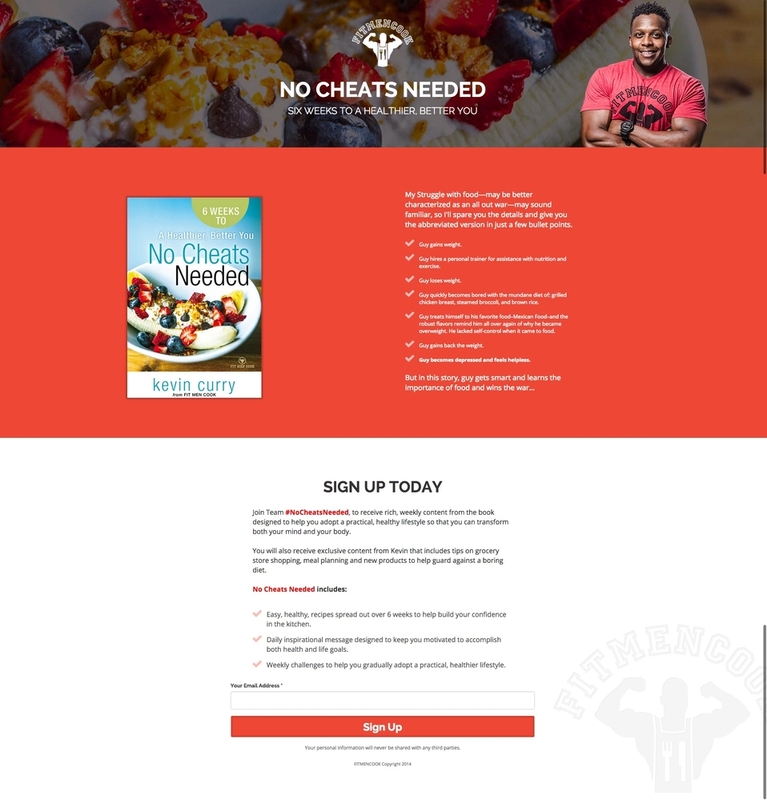 Kevin Curry, author of Fit Men Cook created a landing page for his newsletter that gives away free recipes, daily inspirational messages, weekly health challenges, and more. Kevin Curry’s landing page has generated over 6,500 emails at a conversion rate of approximately 35%. The landing page is simple. There’s lots of whitespace and there aren’t any additional elements that aren’t necessary on this page. It’s not leaky. There aren’t any distractions or leaks on this landing page. You’ll notice that all of these top landing page don’t have a navigation bar or any links to other pages - which characterizes them as not leaky. Non-leak pages have higher conversion rates because landing page visitors only have two choices - to convert or to leave the page. The bullet-point lists are easy to consume. Paragraphs are exhausting to read. Bullet-point lists are much more inviting. GlutenAway provides customers with affordable gluten-free products to try before spending it on the full-size products. 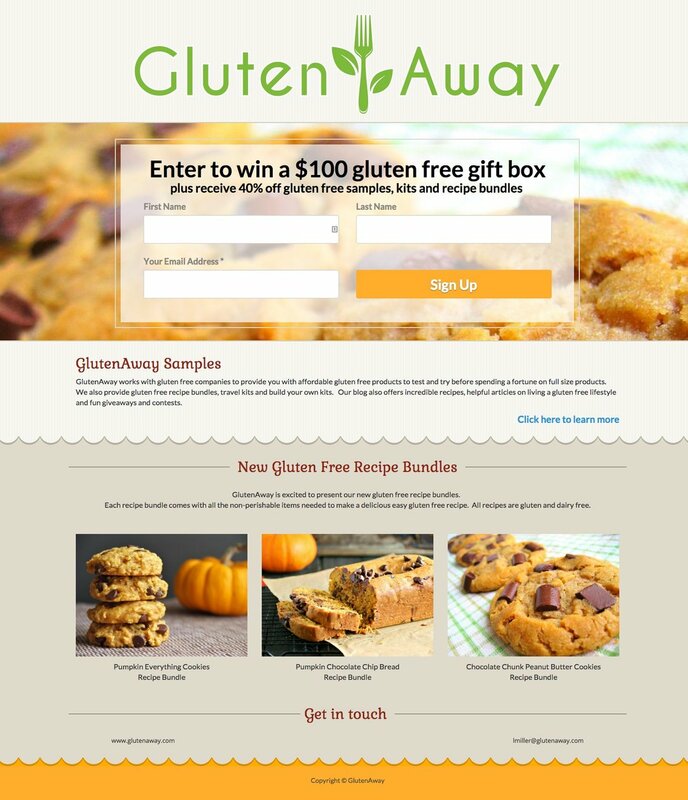 GlutenAway’s landing page has generated over 4,000 emails at a conversion rate of approximately 60%. This landing page may have have generated the lowest amount of emails out of the group, but a landing page conversion rate of 59% is definitely brag-worthy. Nice layout. Design matters. This page seems very put together, has big text and a big form. Clear headline. The headline stands out well on the page and communicates the value of the offer well. Appealing images. It’s important to use high-resolution images that are relevant to your offer. This helps visitors visualize your offer. It has an appropriate amount of form fields. For an offer with so much going on, it’s totally acceptable to have three form fields. Again, make sure your number of form fields are aligned with whatever you are offering. Hopefully these successful landing pages have inspired you to create some high-converting landing pages yourself! Have you generated tons of leads through a recent landing page campaign? Or have you seen a crazy high conversion rate? Feel free to share with me in the comments section below.